Prime Time shopping: If you do not qualify for one of JBF's free presales, you don't have to miss out on the chance to shop first. 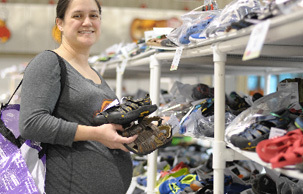 The cost for this special shopping opportunity is $10 per person at the door or in advance. You get to shop after the Consignor Shopping Time. You can purchase your prime time shopping pass in advance to secure your spot to shop this special PreSale Shopping Time. 1. 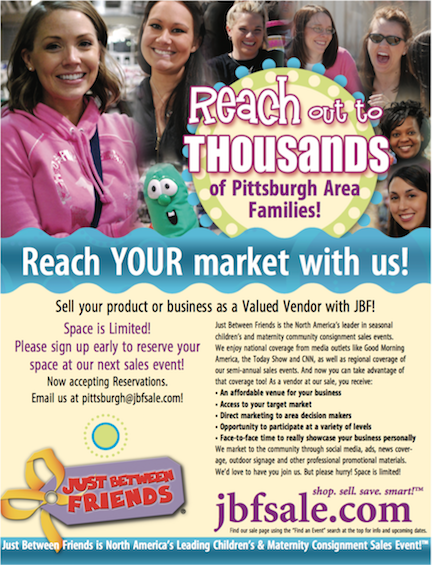 At our JBF Pittsburgh North Events, we love helping area associations and groups by being a fundraising partner! YES! New this sale, we have vendor opportunities! We see thousands of shoppers at our event. If your business or organization is family minded we have opportunities for you to reach our audience. Our vendor opportunities are limited and fill up quickly! You can find more information about our vendor opportunies & sign up HERE.